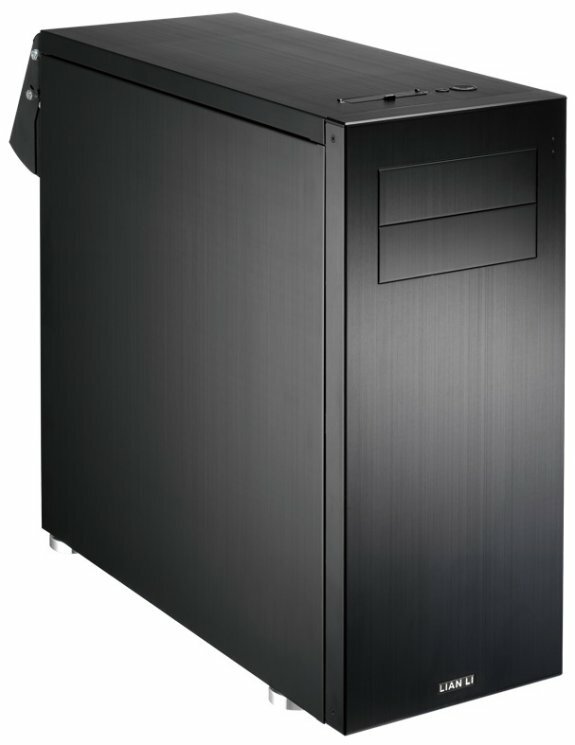 Lian-Li Industrial Co. Ltd, today announces a silent brushed aluminum ATX supported chassis – PC-B12. The PC-B12 has many features to keep noise down to a minimum, including: a vent on the bottom of the chassis pulling in cool air, a downward facing exhaust baffle and noise dampening foam on the front and side panels. The front panel of the PC-B12 has no visible vents. Instead of air entering in from the front, two 140mm fans behind the front panel pull in cool air through the 12cm wide (4.7”) intake vent on the bottom of the chassis. Four sturdy aluminum feet with rubber bottoms to reduce vibrations give ample room for air to be pulled into the bottom vent. The rear 120mm exhaust fan has an adjustable downward facing exhaust baffle on the exterior of the case with noise dampening foam that not only bounces the sound waves down, but also directs the hot air towards the floor. The easily removable front panel and side panels of the PC-B12 both have noise dampening foam to further reduce sound from escaping the chassis. Up to three 3.5” hard drives with an hotswap option and one 2.5” hard drive can be installed in the hard drive cage at the front of the chassis. Two 5.25” drives are easily installed thanks to the bays' tool-less mounting system. Power supplies up to 240mm (9.4”) in length can be placed in the bottom compartment. Ventilation slits underneath the PSU with a removable pull-out filter help increase the life and performance of the power supply. The eight expansion slots on the PC-B12 feature tool-less clamps to secure expansion cards into a locked position. VGA cards up to 360mm (12.1”) can fit in the chassis. The I/O panel located on the top of the chassis contains two USB 3.0 ports and HD audio connections.